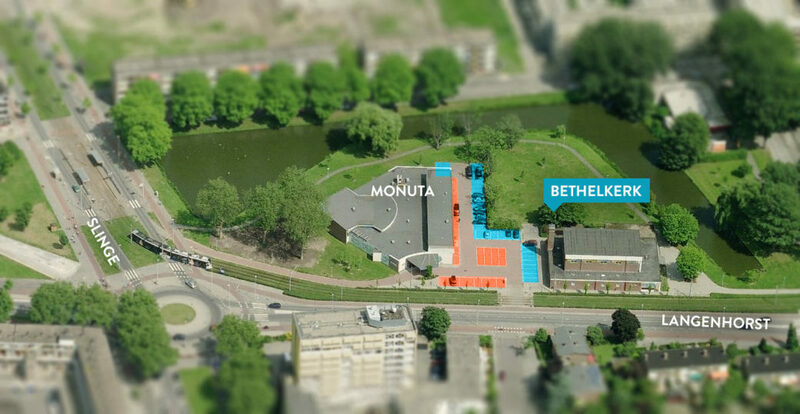 Bethel Church is a Reformed church in the southern part of Rotterdam, and is part of the denomination of the Reformed Congregations. We have two services on sunday starting at 10:00 am and 16:30 pm. You are most welcome. The pastor of the church is Rev. G.J. Baan. The churchservices are conducted in Dutch, but upon request we offer simultaneous translation in English. If you want to visit us and want to make use of this translation facility, please fill in the form below preferably during the week before your visit. This will allow us to make the necessary preparations. Please do not hesitate to contact us; we will be glad to meet with you! During the morning services, there is a crèche and Sunday school for children up to and including the age of 7. The address of the church is: Langenhorst 104, 3085 HR Rotterdam, The Netherlands. On Sundays we can make use of part of the parking facilities of the Monuta organisation next to the church. The picture below indicates the parking places available to us in blue. Two parking places for physically handicapped people are available near the main entrance of the church. The church is also close to a stop of the public transport tram line 25. We believe the Bible is the Word of God which we accept as the only authoritative source for our beliefs and practices as a church. This is why the preaching has a central position in our worship services. The Bible teaches that God is the Creator of heaven and earth and has made man in His own image. Man lost the harmonious relationship with God through disobedience and became subject to death as a penalty. The good news is that the message of the Bible does not stop here. God has demonstrated His love by sending His Son, the Lord Jesus Christ as the Saviour to this world. He has paid the guilt of sinners through his voluntary suffering and death on the cross in their place. Everyone who believes in the Lord Jesus Christ will be saved. The church accepts the three confessions of the early church: the apostolic confession, and the confessions of Nicea and Athanasius, and the three reformed confessions: the Heidelberg Catechism, the Belgic Confession and the Canons of Dordt, as the summary of its faith. Bethel church was instituted on 25 March 1960 as a member church of the Reformed Congregations. This denomination was founded in 1907 by uniting two earlier denominations which both had separated from the main Dutch Reformed church in the 19th century because of the liberalism prevailing at that time.